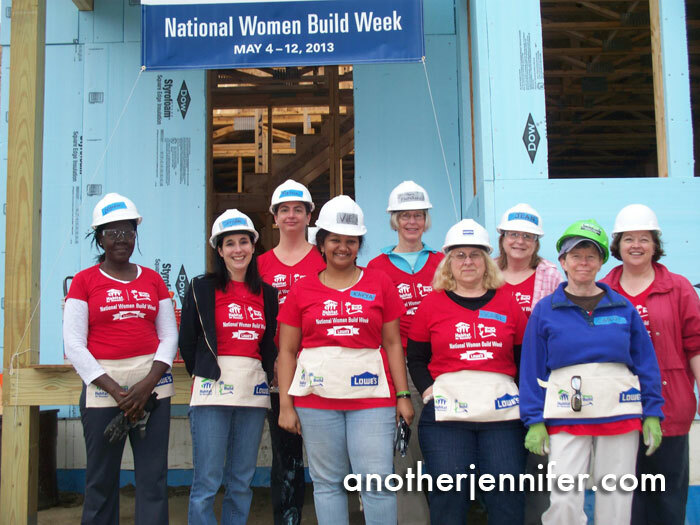 On Friday, I had the chance to help build a decent place to live with a wonderful group of women and the future homeowner of a Women Build Habitat for Humanity house in Freeport, Maine. 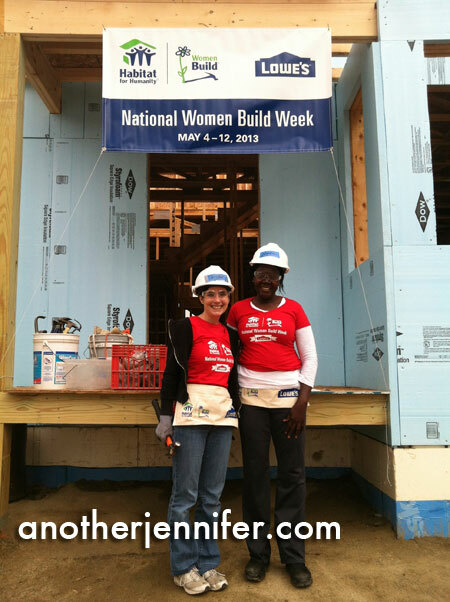 The amazing team volunteering for National Women Build Week in Freeport, Maine. 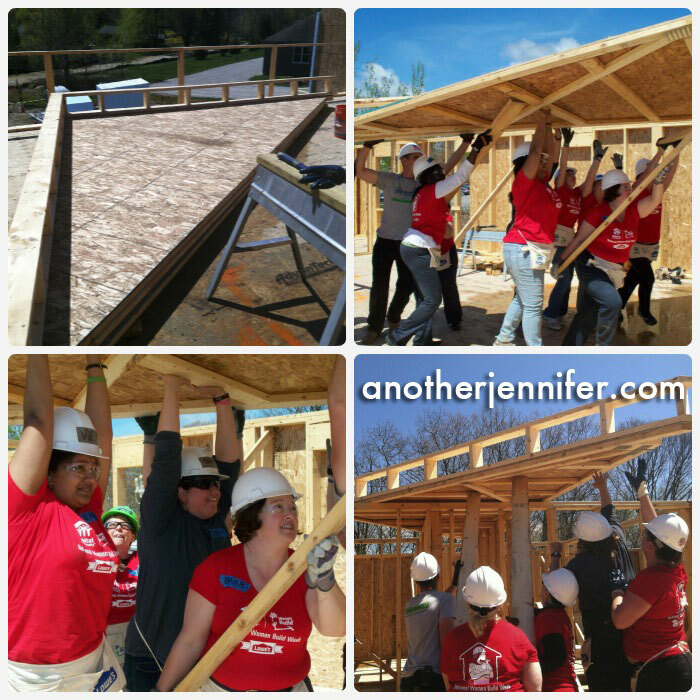 What I learned on Friday is that I was helping to build much more than a home. Nyapeni left Sudan in the late 1990s when her country was in war. After spending some time in Cairo, Egypt, she eventually made her way to Portland, Maine. She told us her story as we took our lunch break on the construction site that was to be her future home. Nyapeni told us of her arranged marriage and how her husband didn’t want her to be educated. She told us how she told her husband she was able to “fly free” in America and how they later divorced. She told us about her four children, two of whom are already successful young men working toward a bright future. Me and Nyapeni ready to build! Nyapeni educated herself in order to provide for her family, and she continues to do so. She works for the Portland public school system as a translator and hopes to become a social worker so she can help more people from her community. She said she is a strict mother and does her best to make sure her kids don’t get mixed up in the wrong crowd. The problem, she told us, is that her younger children are more Americanized and tougher to keep tabs of, particularly in the rougher neighborhood she is currently living in. I kind of look like I know what I’m doing, right? By the way, if you think becoming the recipient of a Habitat for Humanity house is easy (or free), you’re wrong. The process actually takes several months. Applicants have to pay a fee, share financial information and go through an extensive interview process in order to be approved. I worked alongside a few of the volunteer committee members who screen applicants for Habitat for Humanity Greater Portland. They are there to make sure that future homeowners will be forever homeowners. And Habitat homeowners also have to put in 250 hours of volunteer time on their home or other Habitat homes. She was an inspiration to me on Friday, as were all the women building that day. My awesome team for the day. The whole point of the Women Build program is to include women in the building process so that they can learn construction skills on a more inclusive construction site. 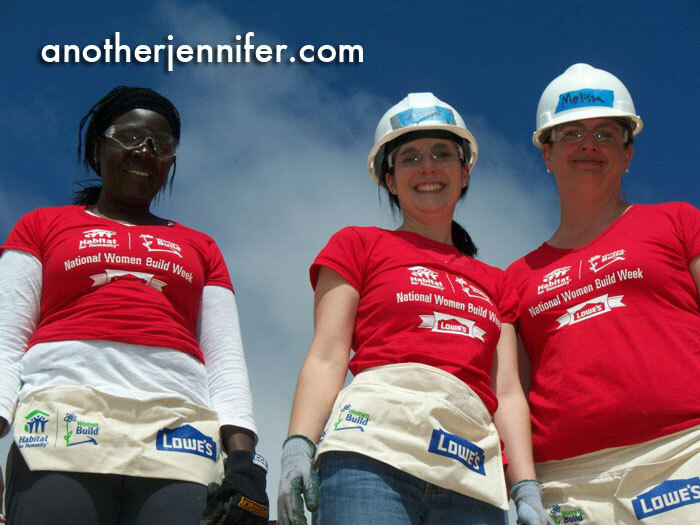 Amy Dowler, the director of operations for Habitat for Humanity Greater Portland, shared with me that most of the volunteers for Habitat for Humanity are women, so the program makes sense. The only man at the site on Friday was Chad, the amazingly patient construction manager for the project. At one point, Chad told us we were going to pick up an 800 pound structure and rest it on the top of the house. We laughed. And then we hoisted that sucker up. My arms hurt just looking at this photo. I could have blogged about my lack of ability to hammer a nail into a board or the difficulty of using a skil saw as a left-handed person or the pain I was in the next day from all my manual labor. But that’s not what the day was all about. I got to help build Nyapeni’s house. This post gave me goosebumps! What an great feeling, to drive by the house and be able to tell your kids you are one of the Super Hoisters who helped build it! Really, 800lbs? Who needs a gym membership when you can get all the strength training you need with Habitat?! Seriously. That should be Habitat for Humanity’s new campaign for volunteers. Strength training for good! That is really great Jennifer! My mom has been doing Habitat for years, and I’ve volunteered on a couple of sites from time to time. It really is a wonderful experience! I love your pics and that you did this! Thanks, Alexa. It was a lot of hard work and a lot of fun! Ha! Thanks, Susan. I tried to fake it. 🙂 Luckily, I had Chad and Nyapeni on hand to help me. This is the first I’ve heard of the Women Build program as well. It’s very cool! Thanks, Cyndi. I just write about what inspires me. Happy that it inspires you too! Nyapeni was awesome. HfH is such a great organization, as a REALTOR I agree that everyone deserves a home and HfH has a great track record for not only helping people obtain their home but also gives them the tools to maintain and keep their home. I was able to join HfH for a week in Alabama after Hurricane Katrina rebuilding homes lost and the gratitude of the homeowners is overwhelming! Patti Lawton recently posted..“2 for 1″ and other facts of Homeownership ….in Midcoast Maine! That must have been an amazing experience, Patti! This is an awesome experience!!! There is a lot of that down here. We have a few communities of Habitat for Humanity Homes on two islands and the Habitat Restore store is on my island. There is nothing better than knowing you made a difference in the life of another person. Rock on Jennifer!! Love the Habitat Restore as well. Living in an old home, there’s always something we need. It’s a great place to buy stuff for the house. Thanks, Jen. A local restaurant donated pizza and sandwiches for lunch. It was great. So much work too. I learned a lot! anotherjennifer recently posted..Are you committed? 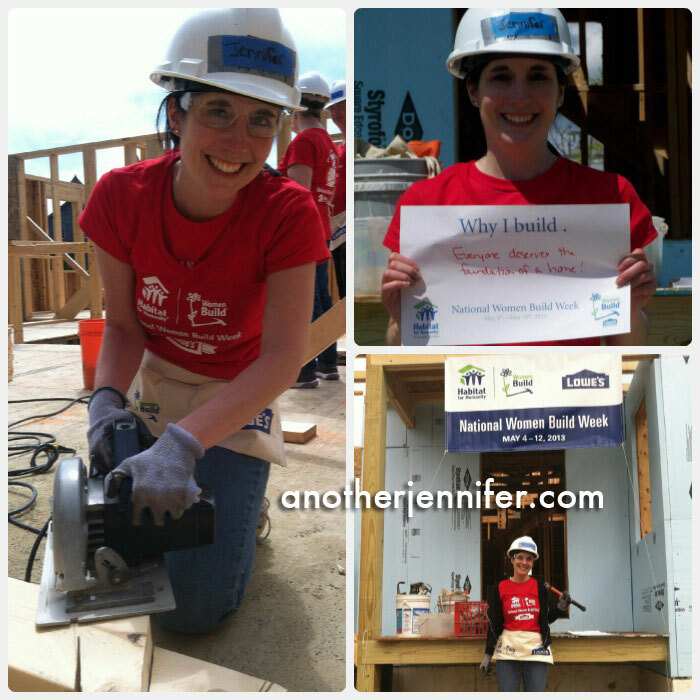 Habitat for Humanity is a great cause! What a wonderful experience! And it’s great that you are making a difference in someone’s life like that! Michelle recently posted..Happy SITS Day to Me! It definitely made a difference to be able to build alongside the homeowner. What a great day! She already is, which is really cool. Winning all around! cool story. Habitat does such good work. I’m tweeting it on (from pesbo) so more can read that. Good for you. It is wonderful to see young adults giving back.